In my "past" life, I was a teacher and a counselor - for 13 years to be exact. I've mentioned before how I was blessed to stay at home once my second child was born. And, I've mentioned how it has made me "re-plan" what I want to do with my life. I don't feel the pull into education as I once did; I want to educate moms - with health and fitness. At the beginning of 2015, I wrote down my resolutions which included getting healthier, getting certified, and starting a blog. I love to write, I want to inspire, and I want to let other moms know that I get it. My message has always been that we are real people behind the "mom mask," and we deserve to have dreams/goals too - no matter our age (Hi, I'm pushing 40!). My blog needs work - pictures need to be better, content could improve, audience needs to grow, etc. But, for my first year, I am proud of what's come out of it, and I can't wait to keep going. I'm currently working on my fitness certification so I can have my own boot camp for busy moms. Not in a gym, but with a small group of moms who want to make fitness integral in their lives. I would also love to do online training so I can help moms whether they are working or staying at home. To make these visions happen, I would love a space in my home that is MINE - as an office and possibly a workout room. WeWork inspired me to share my dream workspace that would fit both the office and exercise format. WeWork is a coworking company with a mission to create a world where people make a life, not just a living! They are inspiring others to consider shared office spaces but also benefits and discounts for people who run their own business. Before I show you my dream, let's see my reality. Our guest bedroom serves as our "office." I don't love it, but with two kids and toys galore, we had to make do. This room houses amenities for our visitors and also works well as an office. Take a peek into our space. Now, my OCD is doing a backflip. I want to get in here and organize like crazy. Problem is - I am married to an IT guy so computer gadgets are everywhere. Until we rearrange and finish some other house duties, this office will do. I want a new computer, a new camera, and new other things that just aren't affordable right now. But, man oh man, if they were.... these spaces would be my dream. The colors in this room are perfect - something bright and cheerful so I can workout and motivate others plus myself. 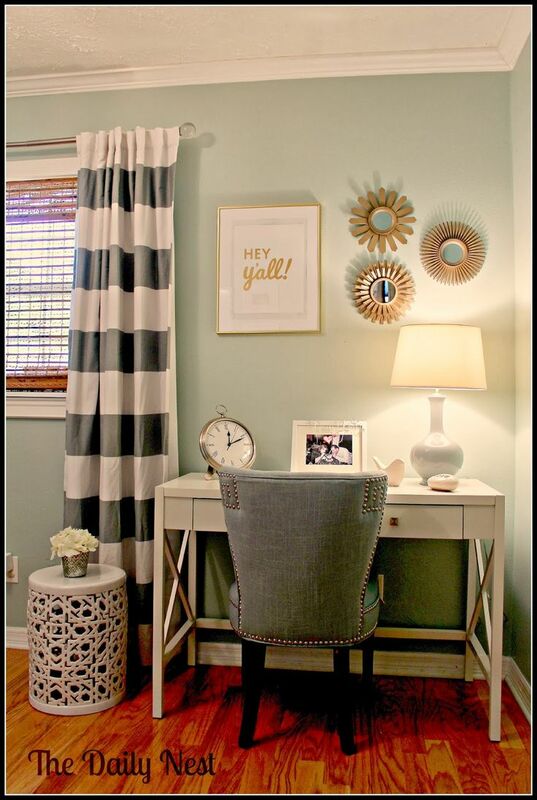 I love the small desk and simple decor; I could work/blog/video chat here and save the other side for working out. Since I workout at home with my fitness programs, I can use the equipment I have in my home gym (a.k.a the kids' toy room now - see the chaos below). I love this set up below for a workout space. Nothing fancy - just the basic equipment and my TV to play my favorite workouts. It's simple, and I love that. What do you have to have in your home office? My wheels are turning, and I am about to blow up Pinterest. Thanks to WeWork for the inspiration!